CAIRO (AP) - Organizers of Egyptian protesters trying to topple the regime of President Hosni Mubarak have called on their supporters to fill every square in the capital on Friday, in the wake of two days of street battles between the pro- and anti-government camps that marked an ugly turn in the country's crisis. The Obama administration, meanwhile, was in talks with top Egyptian officials about the possibility of Mubarak immediately resigning and the formation of an interim government that could prepare the country for free and fair elections later this year, U.S. officials said Thursday. The talks were first reported by The New York Times. White House and State Department spokesmen would not discuss details of the discussions U.S. officials are having with the Egyptians. Mubarak, 82, told ABC television in an interview that he was fed up and wants to resign. But he said he can't for fear the country would sink into chaos. 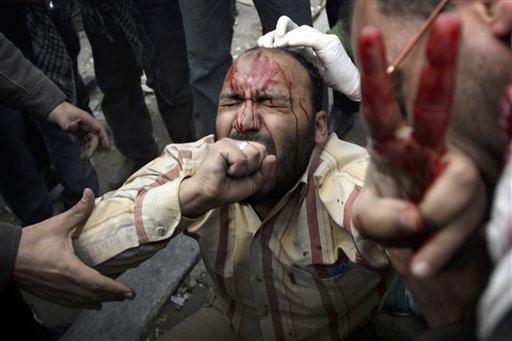 He said he was very unhappy about the two days of clashes in central Tahrir Square. White House spokesman Robert Gibbs denounced reports of "systematic targeting" of journalists and the State Department described it as a "concerted campaign to intimidate." "I think we need to be clear that the world is watching the actions that are taking place right now in Egypt," Gibbs said. Amnesty's secretary-general Salil Shetty demanded their immediate release saying they should be allowed "to monitor the human rights situation in Egypt at this crucial time without fear of harassment or detention." Mubarak's top ally, the United States, has pressed him to quickly transition to a democratic government but has said his earlier gestures, including forming a new government, were insufficient. After nightfall, the fighting died down with protesters' hold on the square and nearby streets unbroken. Nearly 10,000 remained, some dancing and singing in victory as others - battered and bandaged - lay down exhausted to sleep or drank tea in the center of the rubble-strewn roundabout. Throughout the day, they gained in numbers and got supplies of food and medicine. Many of the square's defenders had cotton padding and grubby bandages dangling from their faces, arms and legs. Others had chunks of rock stuck to their hair and clumps of dust in their beards. Many had the trimmed beards of Muslim conservatives, a sign of the Muslim Brotherhood's role in the fight. The Brotherhood is the country's largest opposition group but secular groups have led the protests. The top U.S. military officer, chairman of the Joint Chiefs of Staff Mike Mullen, told Jon Stewart's "The Daily Show" on Comedy Central that he has spoken to his military counterparts in Egypt ahead of Friday's rallies and was reassured they have no intention of firing on their own people. The prime minister apologized for Wednesday's assault and acknowledged it may have been organized, though he said he didn't know by whom. Suleiman promised that Mubarak's son Gamal would not run in presidential elections in September. Before the protests, Mubarak was widely expected to try to pass his power to his son in a hereditary succession, despite significant public opposition. An exodus of foreigners, meanwhile, continued for another day Thursday with the U.N. evacuating much of its staff. The vice president said 1 million foreign tourists have fled the country, costing $1 billion in lost revenues from one of Egypt's most important industries. AP correspondents Hadeel al-Shalchi, Sarah El Deeb, Hamza Hendawi, Diaa Hadid, Lee Keath and Michael Weissenstein contributed to this report.